I think of all the peak food seasons in the summer, I look forward to corn season the most. It lasts such a short time and there is really no substitute during the rest of the year that even comes to close to the amazing taste of fresh sweet corn. I grew up eating a lot of corn in the late summer months, but never really ventured far from eating it straight off the cob with a bit of butter, salt, and pepper. We didn't need to try anything else when it was so good that way! 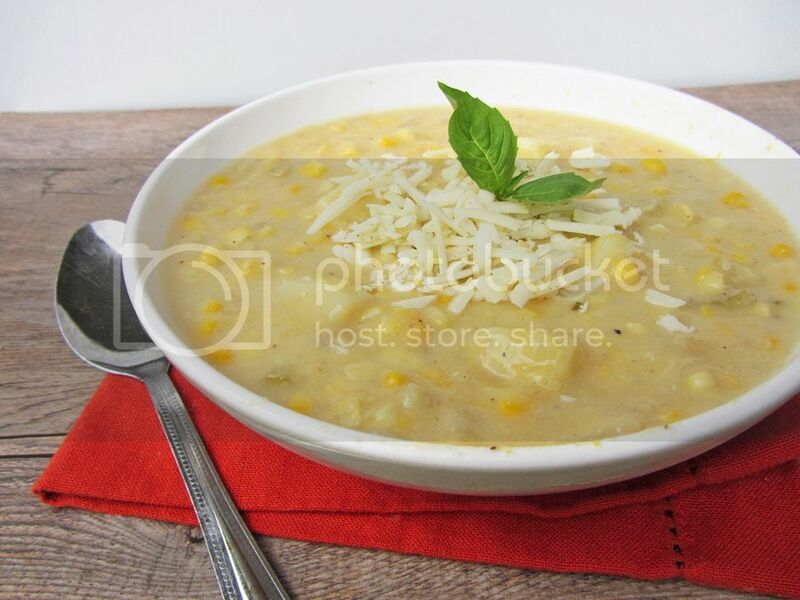 When I saw a fresh corn soup on Oh My Veggies a couple of months ago, I commented that I'd never heard of a warm corn soup, and I think I was the only one who hadn't! Once I thought about it though, I realized that these warm corn soup lovers were probably on to something amazing that I'd been missing out on for far too long. I tested it out one night by basically dumping some corn and milk in a pot then blending it, and it was delicious. Then I imagined how much better it would be with a bit of wine, chicken stock, potatoes, and cheese to make a chowder, and got right on it! I found a recipe for a white cheddar corn chowder on Whole Living that didn't use butter, flour, or heavy cream, but still allowed for a bit of indulgence with potatoes and a small amount of cheddar cheese (which I replaced with pepper jack for a bit of spice). Even though it was much lighter than say, Ina Garten's cheddar corn chowder with bacon, half-and-half, butter, and tons of cheese, it didn't taste light at all! This was so thick, rich, and comforting, but with the bright summer flavours of fresh corn. It was one of those meals where I could not wait to eat leftovers and was so sad when it was gone. I cannot believe I've been missing out on corn soup for so long - don't miss out like me and make this while fresh corn is still in season! P.S. Don't judge this dish by the photos! It's hard enough to photograph soup but I took these in poor lighting late in the evening - trust me that it's a lot better than it looks here! Heat oil in a large saucepan over medium heat. Add onion and cook until softened, stirring often, about 4 minutes. Add the celery and cook until tender, about 4 minutes. Add the coriander and cumin and stir for about 30 seconds. Add the wine, raise heat to medium-high, and cook until most of the liquid has evaporated, for about 2 to 3 minutes. Add the potatoes, chicken broth, and milk, and bring to a boil, skimming any foam that forms on the surface. Reduce heat and simmer until potatoes are tender, about 20 minutes. Add corn and cook until tender, about 5 minutes. Remove soup from heat. Transfer 2 cups of soup to a blender, let cool slightly, remove the plastic stopper from the blender lip and cover with a paper towel, then puree. You can puree a larger portion of the soup if you prefer a smoother soup. Return the puree to the rest of the soup in the saucepan, stir, and reheat if necessary. Add grated cheese and stir until mixed in. Season with salt and pepper. Pour into bowls and top with additional grated cheese and pepper if desired. My friend is bringing me some fresh corn from her farm today. I know what I'm making with it now :) Thanks for the awesome suggestion. This looks so yummy! Perfect to help me get over the flu. Corn is definitely one of my favorite veggies of summer! You really can't beat it's addictive sweetness. I'm loving the sound of this soup!! Thanks for the mention! 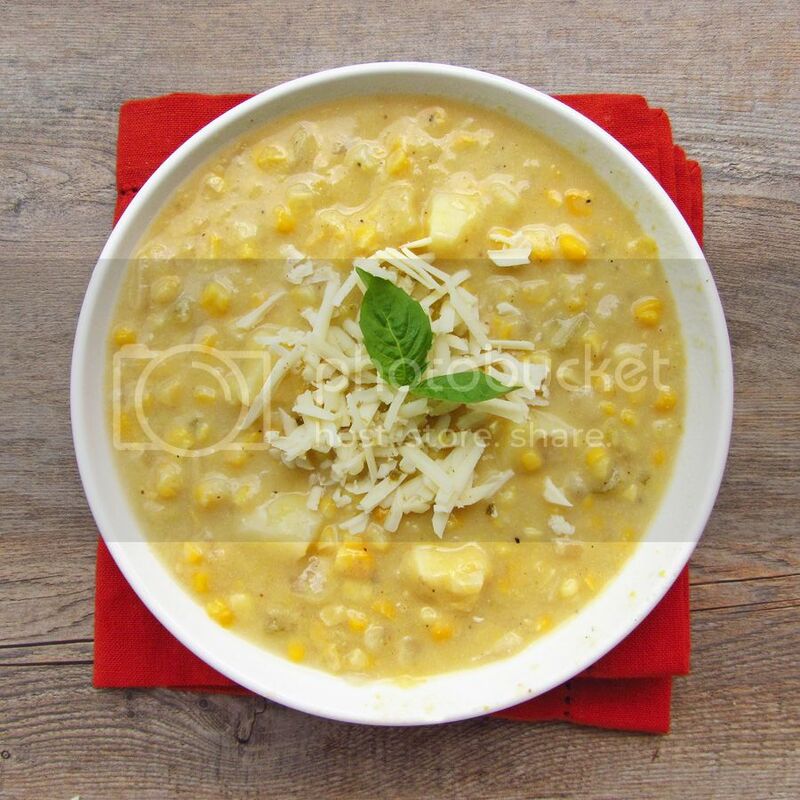 Corn chowder is one of my all-time favorite soups. It's definitely a great comfort food and I love the idea of adding pepper jack cheese to it. I wish I was having this for lunch today! I know, I don't think there's anything that corn doesn't make better!